When it comes to running a commercial kitchen, there is only one certainty: you will need repair service and you will need equipment parts. With the understanding that no kitchen can function without properly performing equipment, the only question now is – what parts & service company is the best choice for you? At CPS, we believe that our People Behind the Parts give us the edge over other commercial parts & service companies. Here are a few reasons why our people give us an advantage and how our people are equipped to better help you, the customer. 1. Our People Behind the Parts…have direct access to manufacturers. By establishing relationships with manufacturers across the country, our people always have a direct line to the producers of the parts you need. That means, if you can simply provide the serial number for the part you’re looking for, we’ll get you that exact replacement part in no time at all. 2. 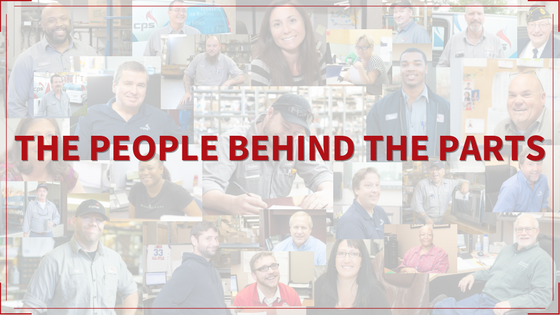 Our People Behind the Parts…always answer the phone. When you call us with a question, we will never make you go through a lengthy automated process. At CPS, our receptionist is standing by to greet you and direct you to the department you’re trying to reach. 3. Our People Behind the Parts…give you the best price. We always try to find you the best deal, but that doesn’t mean sacrificing quality for cost. We only provide top-of-the-line OEM parts, but we have the ability to price match just about anything. 4. Our People Behind the Parts…provide 24/7 service and support. Restaurant emergencies happen without notice and often at the worst times. That’s why our people are available around the clock for emergency service and technical support. 5. Our People Behind the Parts…are experienced professionals. With over 45 CFESA-certified technicians on our team, we don’t just hire anyone. Our Service Technicians are experienced professionals with high first-time fix rates and we reward them with competitive salaries, benefits and career opportunities at CPS. When you choose our People Behind the Parts, you never have to worry about unreliable, fly-by-night technicians.